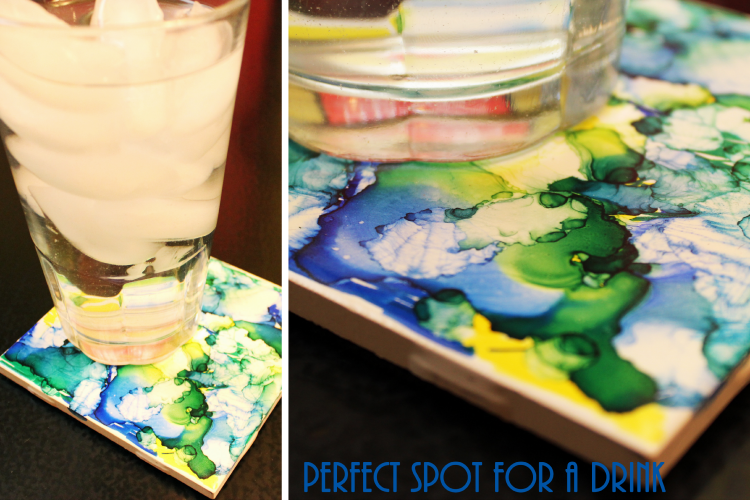 DIY Coasters: Fun Craft Coaster Making with Watercolors - Try It Now! When winter bows out and spring starts to wrap her warm arms around us, I can’t help it but crave a bit of color! We see color popping everywhere, why not inside too? 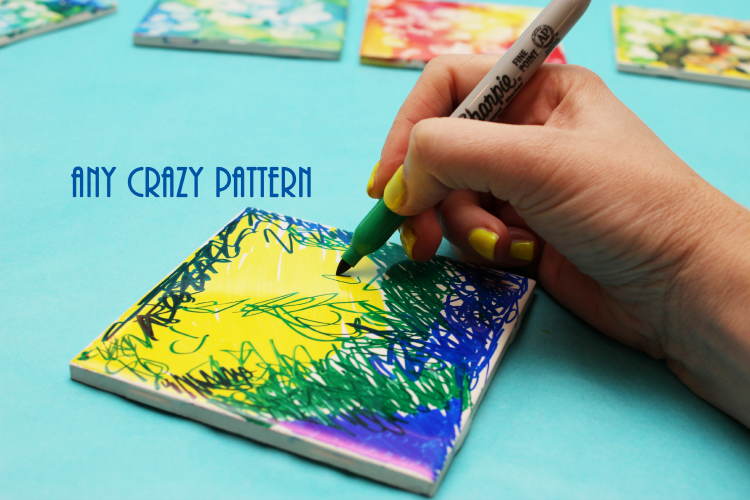 Creating your own set of DIY Coasters is the perfect way to bring a bit of the outside color in! Even better, coaster making is easy as pie and only require a few inexpensive supplies. 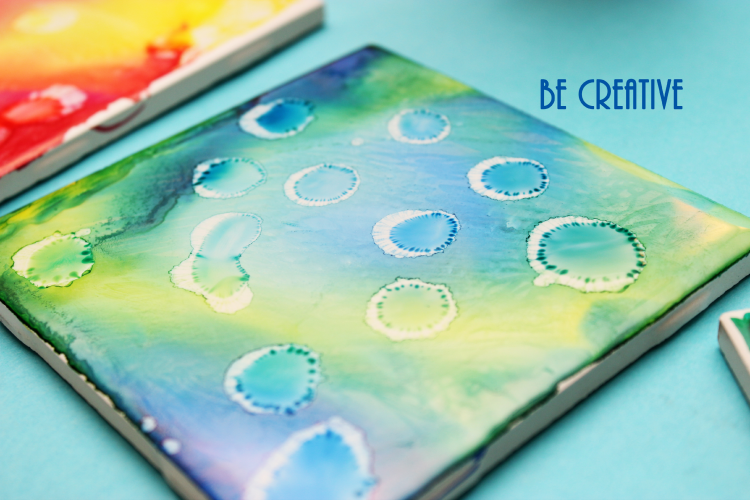 The best part about creating these DIY Coasters with Watercolors is the fact that you may have most of the supplies in your cupboards at home already! 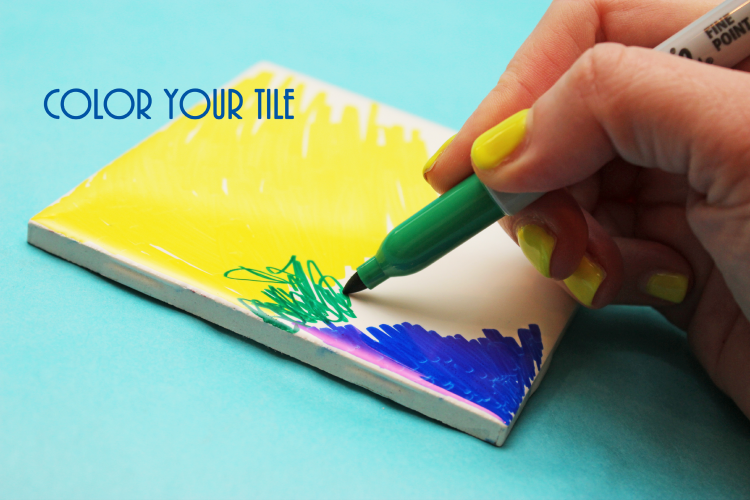 To begin, choose a tile and using your Sharpie markers, color a crazy pattern or design. There is no right or wrong way to do this! Just let your inner artist out and draw! After the first puddles of alcohol have dried, drop another round of puddles on top of your tile. 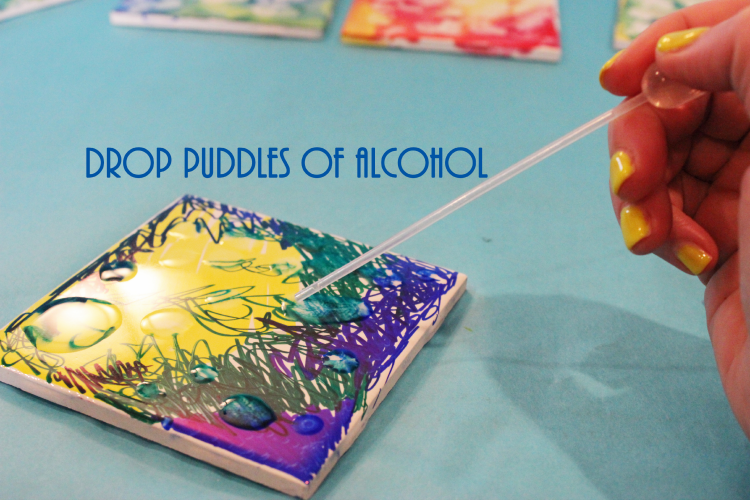 Try to focus in on areas that have not had alcohol on them, but you can drop puddles on top of dry puddles. 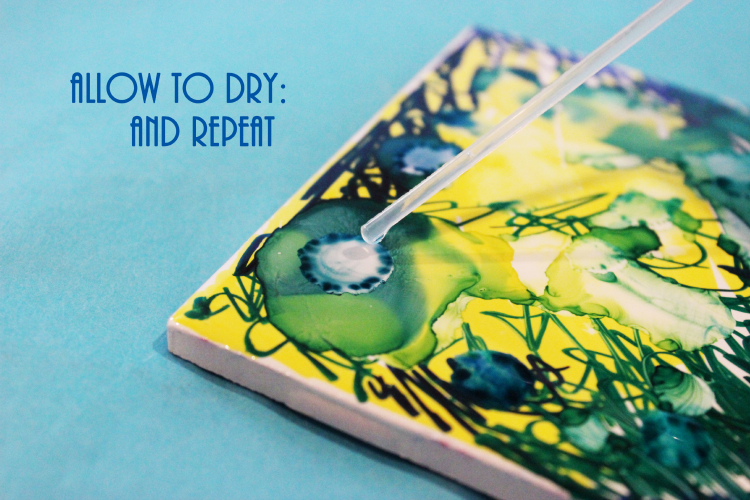 Continue this process of dropping puddles and allowing them to dry until you get the effect you are looking for! 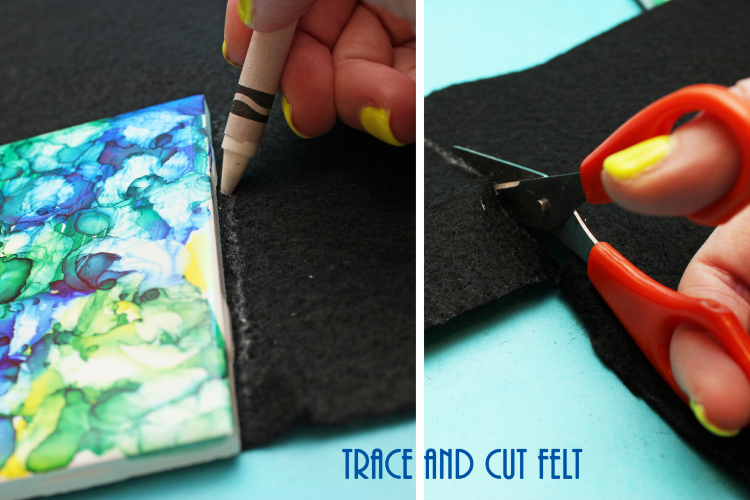 When your tile is finished and you are ready to move on, place it on top of your felt and trace around it using a piece of chalk or a crayon. Cut out your shape. 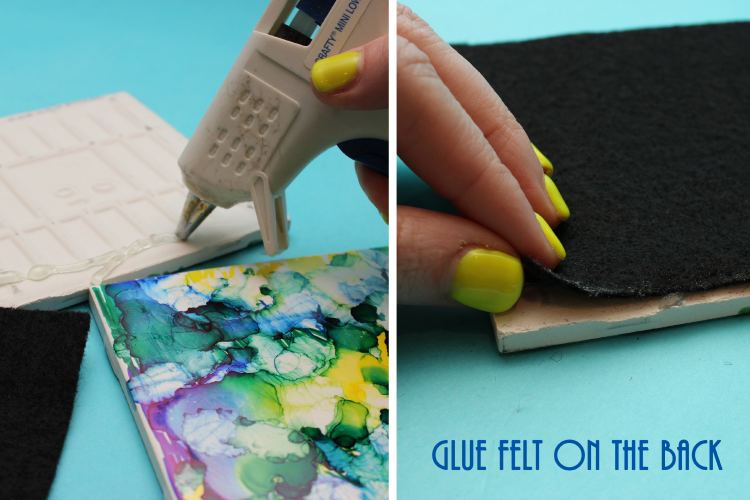 Next, turn your tile over and glue the felt square onto the back. Press it down to smooth any bumps. 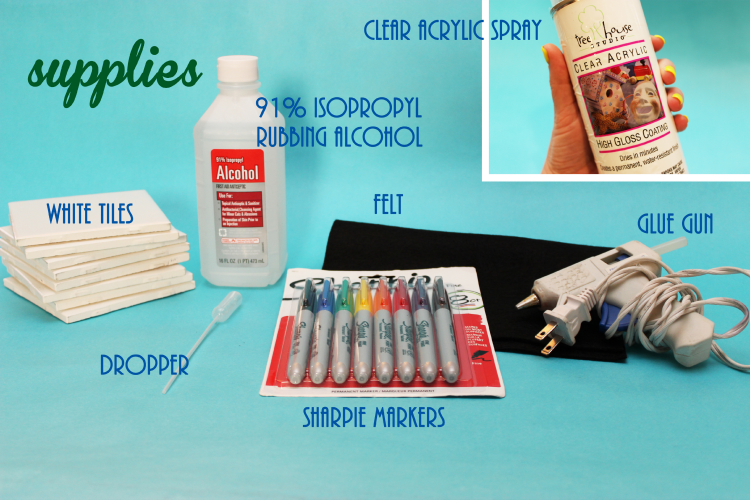 To complete your DIY Watercolor Coasters, spray the tops of them with a clear acrylic to seal in the ink and make a waterproof surface to place a drink on top of. This step is best done outside. 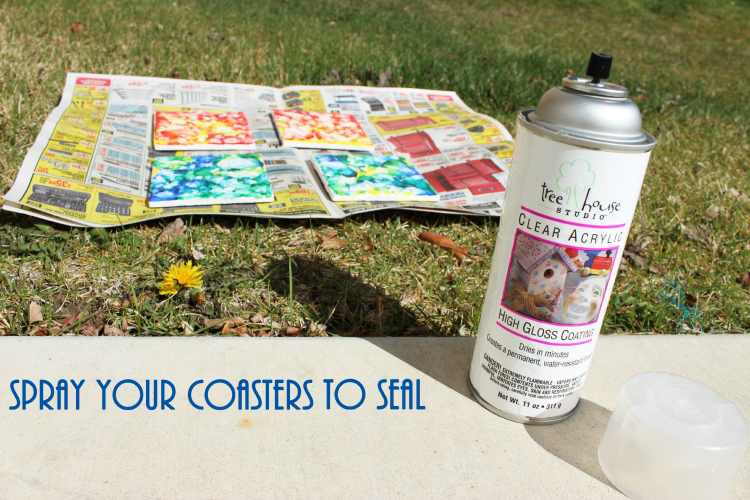 Allow your coasters to dry a full 24 hours before you use them! 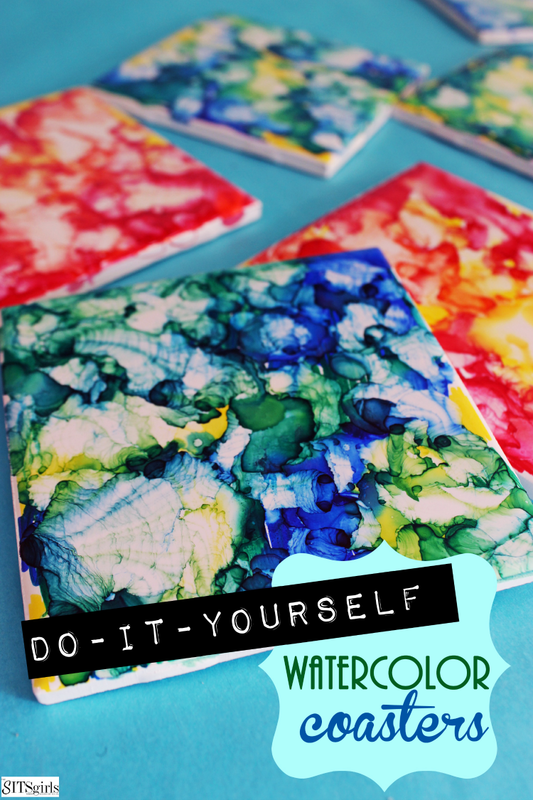 DIY Watercolor Coasters are not only easy, but they are the perfect homemade gift for friends! Do you have a craft, recipe, or another Pin-teresting post that you want to share? Use the below Linky to get featured! We’ll be sharing our favorite posts in the coming week across our social media channels, on the blog, and in our newsletter. Be sure to spread the comment love! If you link up, please comment on at least three posts that grab your attention. 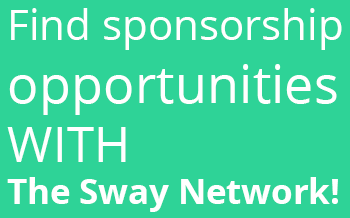 We’re looking to help our community continue to grow their tribe and spread the comment support. Here are our favorite picks from last week’s link-ups. Show these ladies some love! Emily is a apron-wearing, camera-wielding, mother and pilots wife who has found her niche in discovering a reason to celebrate every day and enjoying the simple things life has to offer. Great idea! We just finished a bathroom project and have lots of left overs. I was wondering what I should make with them. Thanks! Thanks for featuring my Spring Bucket List! I love the SITS Girls and reference your blog often! Thanks for the great info and the blogging love! Just added my Recipe in the link! You are simply amazing Girls! Love your site and all the supportive work! 🙂 Thanks! Where can I find rubbing alcohol!?? 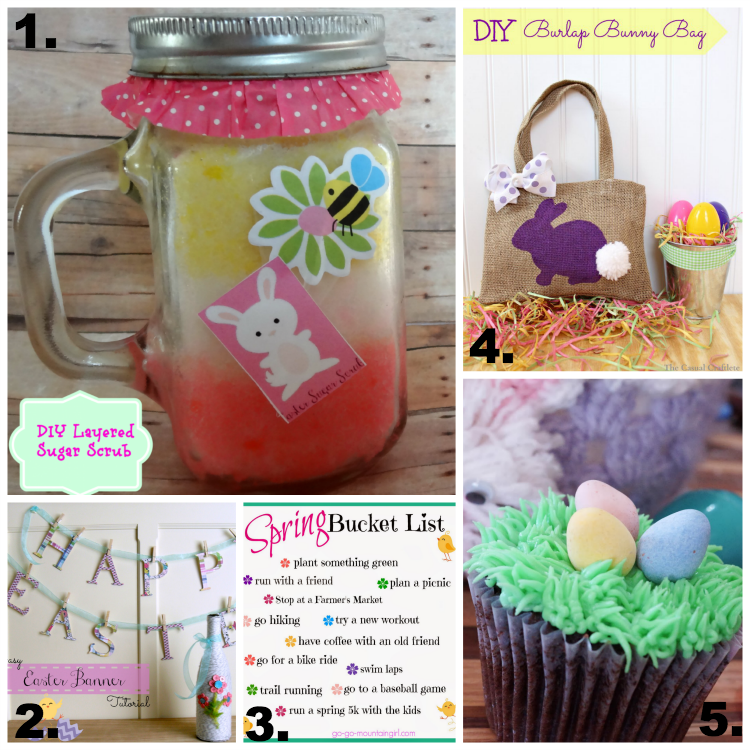 Thanks for featuring my Easter Egg Hunt Cupcakes this week! 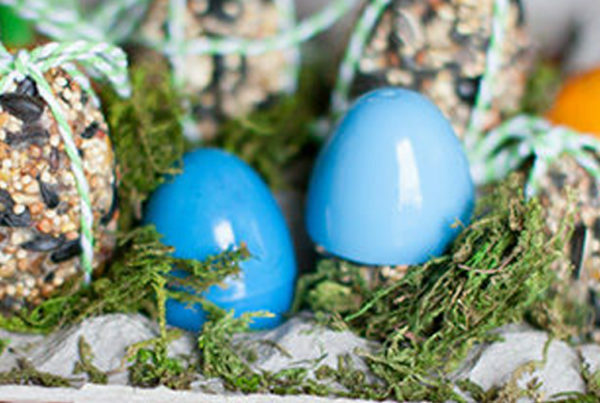 I love this idea – I can’t wait to make my own! Love this idea! So cute and easy. I tried decoupaging ceramic coasters once and failed. Pretty sure I can master this. Those coasters are so cool! I love how the watercolor effect makes them look. It would definitely add an artistic touch to any living room. Thanks for another great link up, SITS Girls! Thanks for doing this ladies. 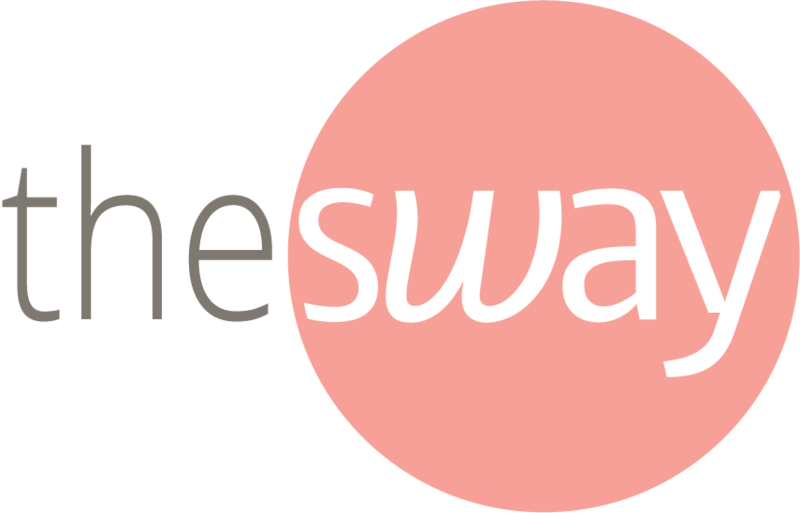 So many wonderful recipes, craft ideas, encouragement and advice. Love it! Great craft, the come out really striking! And they look really easy to make. 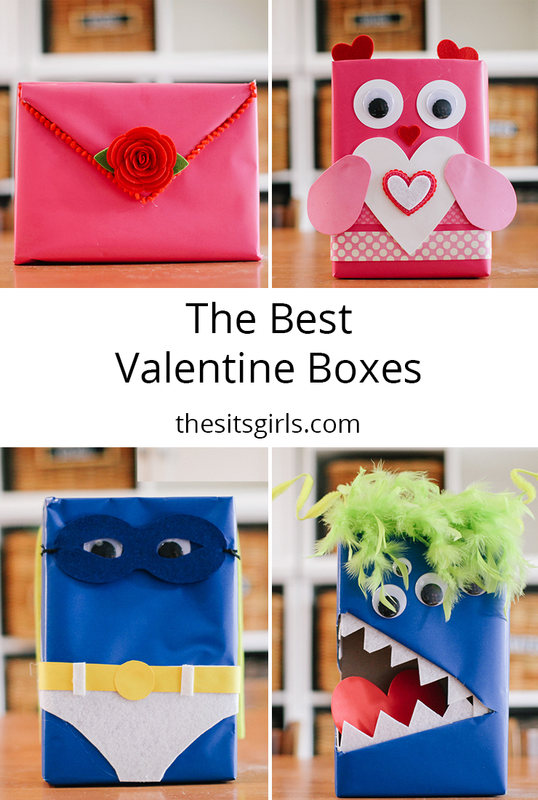 These are such a fun, crazy project! I can see my daughters getting very creative with this whole process! Thanks for sharing. These are great. I’m definitely going to try these. I’m soooo tempted to say “waste of good alcohol” but I won’t as you did use the non drinkable kind! 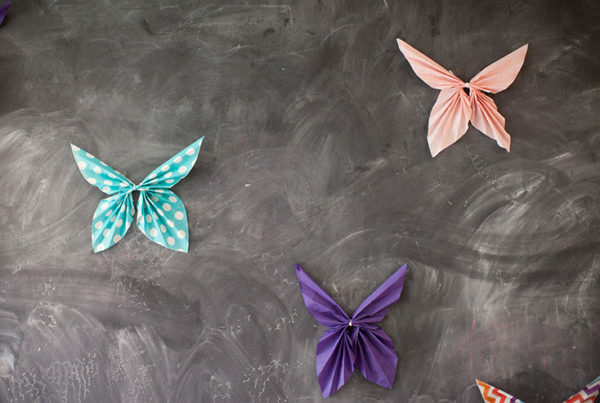 These are beautiful and what a versatile idea. Love it. The coasters look great and like fun to create! Thanks so much for hosting. Wow, you make it look so easy!! wow! What a simple and great craft! So Simple to match the colour scheme of the room as well..
Love those coasters! Such a neat technique. Thanks for featuring my bag, Ladies! Have a great week.